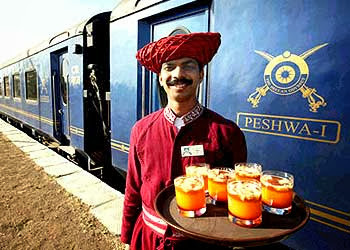 The concept of luxury train takes inspiration from the magnificent royalty in the country. Fondly addressed as the golden bird for its richness and grandeur, India in its antiquity was the land of the kings. These royals had great command in their kingdoms and lived life in indulgence. Out of respect, these Maharajas or the great kings also had access to the best of luxuries in the world. Thereon, their preferences became the landmarks in the cultural heritage of the country. The palaces and forts created by them are the great architectural icons of the land. Their lifestyles are the set benchmarks for the ultimate Indian luxury. These royals with every way possible contributed to the grandeur and the glory of the country. Be it their work, righteousness, love for their kingdoms or the indulgent lifestyle; all present the rich glorious world of the royals. Their way of life in the same way is a spectacular experience. The way they led their daily life is still a mystery. The luxury trains of India unfurl that mystery by providing the same set of royal experiences to the modern day traveller. The pampered hospitality of attendants, royally bedecked ambience of coaches and suites, chef specials culinary delights and spirited lounges, all provide an immaculate experience of royal past in the modern times. Off-board, these travellers receive a privilege of visiting the bastions of royalty. These include a visit to the fantastic forts, plush palaces, the royal game drives in the wildlife resorts, temples and museums. Every excursion here narrates the rich golden era of royalty and provides the passengers an equally enchanting experience to the journey of dreams. Currently, there are five luxury trains in India chugging on the regional routes to royalty. Out of five, two i.e. Palace on Wheels and Royal Rajasthan on Wheels make their way to the land of the kings, Rajasthan. The third special railway, Deccan Odyssey is the epic journey to the land of brave Marathas, Maharashtra and its unique royal roots. The next one, Golden Chariot is a pan south India train discovering the wealth of the region through its two itineraries. But the grandest among all is the Maharajas’ Express which is truly a respected king of all the luxury trains. And why not? This mega train franchise diversifies in to five distinctive routes, but the grand essence remains the same in this heritage trail.